When we talk about Greece, we imagine sunshine, cozy white little houses spread over the hills, decorated in blue, clear sky and turquoise calm sea. And history. Meteora (Μετέωρα) is one of the largest complexes of monasteries in Greece. It's second only to famous Mount Athos in Halkidiki peninsula. 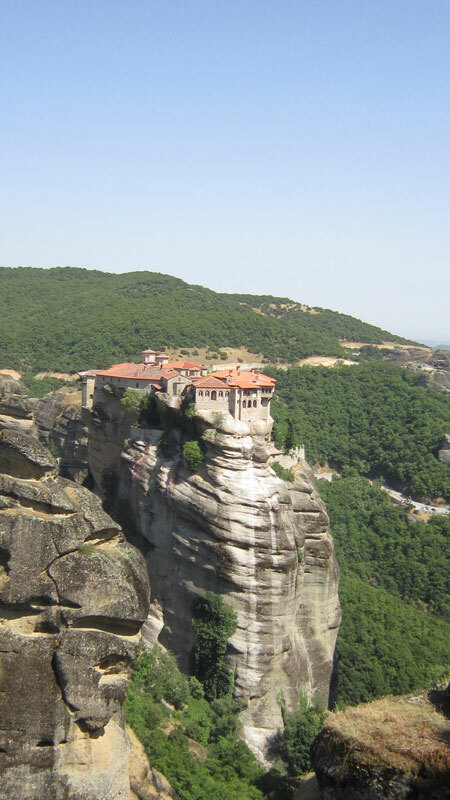 Meteora is located at the northwestern edge of the Plain of Thessaly. It's about 70 km on the west of Larissa. The nearest town is Kalambaka. There, in the dark green mass of trees, about 60 gigantic rocks (upto 300 metres in height) are reaching high to the sky in different shapes, like towers. The monasteries are uniquely located on the top of those sharp rocks. The exact date of the establishment of the monasteries is unknown. By the late 11th and early 12th century, a rudimentary monastic state had formed called the Skete of Stagoi and was centered around the still-standing church of Theotokos (mother of God). In 1344, Athanasios Koinovitis from Mount Athos brought a group of followers to Metéora. 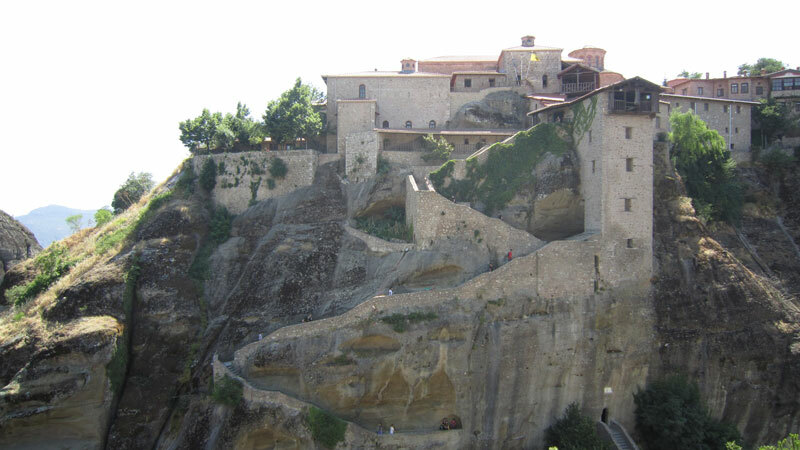 From 1356 to 1372, he founded the great Meteoron monastery on Broad Rock. The only means of reaching it was by climbing a long ladder, which was drawn up whenever the monks felt threatened. There used to be twenty- four monasteries; now active are only six or seven. 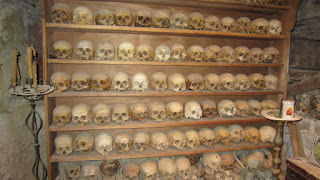 Each monastery has fewer than 10 inhabitants. The monasteries are now tourist attractions. Although Meteora is one of the top Greek attractions, the place is quite isolated (seclusion is part of the monastery idea, I guess). We reached it with a rented car from Tipoa Car Hire from Thessaloniki airport. It was easy to find it after less than 3 hours drive. From the airport, we crossed Thessaloniki heading for the highway to Athens (E75). After a short drive, we followed highway E90. Both highways required partial toll payments. It costed us about 5 euro in tolls. At Grevena, we took the Exit 15 to Trikala. The road is new but it has a lot of turns (way too many :-)) There are plenty of Meteora signs on the way, so you can't miss it. 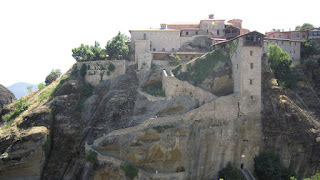 A road is heading right to the top of the cliffs so you can park very near to the monasteries. Admission ticket for Holy Monastery of Great Meteoron is 2 euro. 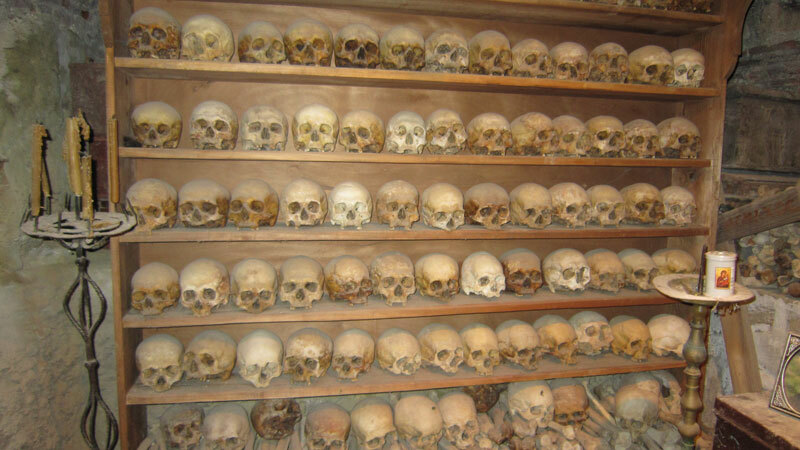 There's a striking skull room inside (still shivering). You could easily spend the whole day, wandering around the monasteries. The nearest town of Kalambaka is a tourist place so it has a lot of restaurants, taverns and little comfy hotels to stay. Finally, a tip for car hire travellers: bring your own GPS (if you have one)- this will save you costs and you'll still be able to find your destination of interest.